I have the first issues of Toby and See Saw and am now in the process of uploading so check all the links.There will also be scans of the actual free gifts.I am particularly interested in either purchasing or recieving good quality scans of the Merger issues with See Saw and Jack and Jill. Also,as time goes on,will put up forum if interest is there.Don't forget to sign the guestbook. WHAT'S IN STORE FOR TOBY...? As I mentioned in previous posts,I will be rearranging certain aspects of the site as time allows.Unfortunately one of the provisos of this new work will be the removal of the See Saw first issue.This is to allow for more space for Toby-centric info and strips.I really need scans of the first merger issues with See Saw and Jack and Jill to realise a new page based on the entire run of Toby!Only you can help.I've also added a new FUN! page,so pop on over there to see what's up.Also,I'm pleased to see people are finally posting in the Guestbook,so I've altered the question layout to include names(it's nice to know who you are)and some more queries.Don't forget to visit or revisit if you've been before.Talk to you soon! p.s. I'm leaving the first issue of See Saw online until Al from ComicsUK does a review,so view it while you can,'coz then it'll be gone! 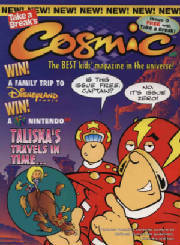 Exciting news,comic lovers.Coming soon to a web site near you,we proudly present Cosmic!We're keeping the plans under wraps for the time being,but rest assured you will like the results.Stare in wonder at the adventures of Captain Cosmic and others as we celebrate the first issue of a bygone comic.And it's not even Issue One?!? 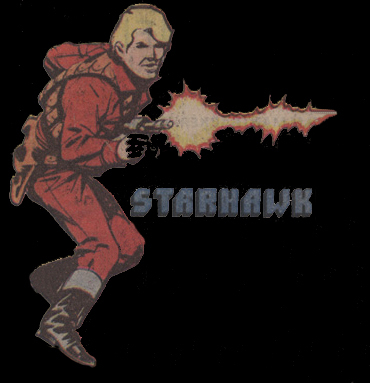 Another site that may see the light of day sometime in the future centres on this popular character from the 70's...STARHAWK.He first appeared in the Crunch comic and also appeared in the Hotspur when the two comics joined in 1980. 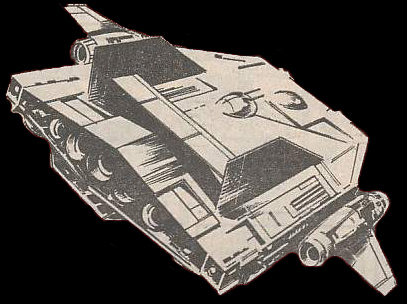 Okay folks,the Starhawk site is now online,well worth a visit! The new format for the site is now underway,tables and thumbnails.Issues 1 and 2 now online for your reading pleasure!Summer Special 1976 coming soon as well as Annual 1977,so stay tuned.A lot of material has been deleted but will be reinstated very soon in keeping with the new look and feel of things,so don't despair.Also,Issue 1 of See Saw will be back online in a few weeks,folks.Take care! Sorry for the delay in updates but have been very busy over at the Starhawk site.Have cleaned up the Toby and Goody Fox character pages and organised them into tables.Also some pages from the Annual 1977 and Summer Special 1976 are up.A lot of the original issues need extensive work in Photoshop due to bad wear and tear and that process unfortunately takes time.Will be working here again soon so please be patient. Have FINALLY got Issue 3 back online.I promise See Saw and maybe Issue 4 will follow suit before the end of the week,so check back folks. At long last Issue 4 makes it's internet debut.Another exclusive for the first and only Toby site around!More to come very soon. See Saw Issue 1 is back!Go to the History page and click on the thumbnail to read the very first issue!